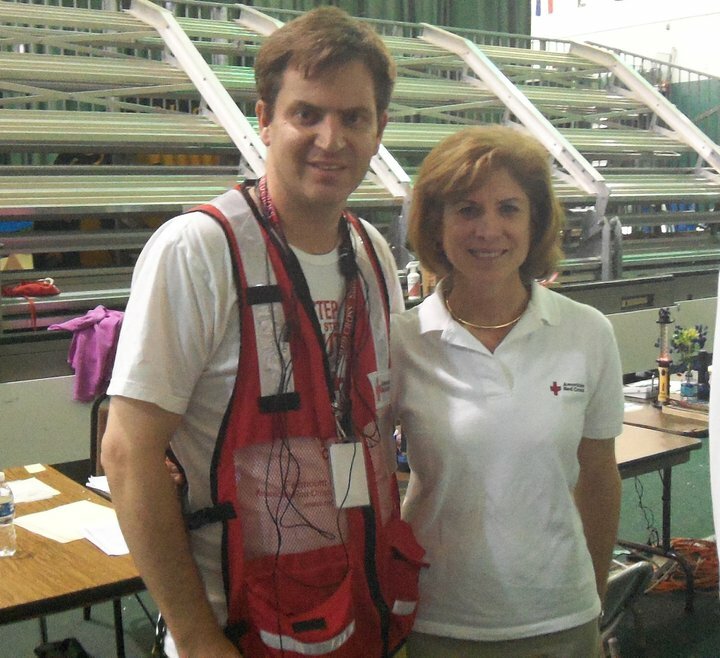 On Saturday June 2, 2012 I participated in a shelter drill in Chester County at the Avon Grove High School. In addition to representatives from various partner agencies, I was surrounded by friends in red vests. They were American Red Cross volunteers from the surrounding counties, all there to participate in a complex drill involving opening a shelter for theoretical tornado victims in Chester county. They gave up a Saturday to start early in the day, preparing the high school, loading in supplies, establishing assignments and chains of command, and in theory, preparing for the worst. They might have been preparing to welcome friends and neighbors, but most likely they were there to help people they had never even met. Things got into gear once the pretend clients started arriving, lining up to be registered, triaged, assisted, and in many cases hugged and welcomed. That’s the way it’s done. People you have never met and don’t know become your temporary responsibility while they sort out their lives and take the next small steps towards recovery. 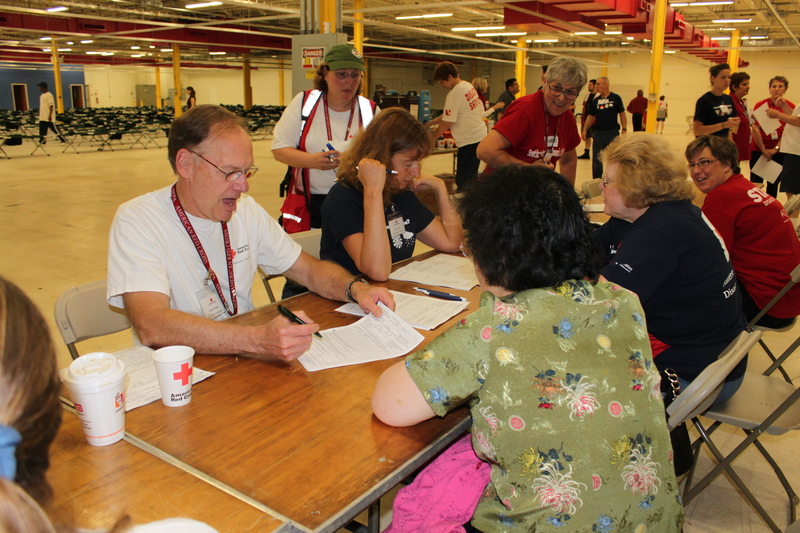 The volunteers were there to learn, practice and keep their skills sharpened for the unwelcome day when reality will turn the drill into a disaster with an official American Red Cross DR number. Interestingly enough, Friday evening saw inclement weather blanket the area, there were tornado watches and warnings, and enough possible uncertainty to make some of us wonder if we might be called out a little earlier than the original 8:00AM start time. But thankfully, it remained a drill, and I personally had the opportunity to both learn and teach, meet some old friends and acquaintances, and make some new ones. Some of my best friends wear red vests. Some of yours do too. 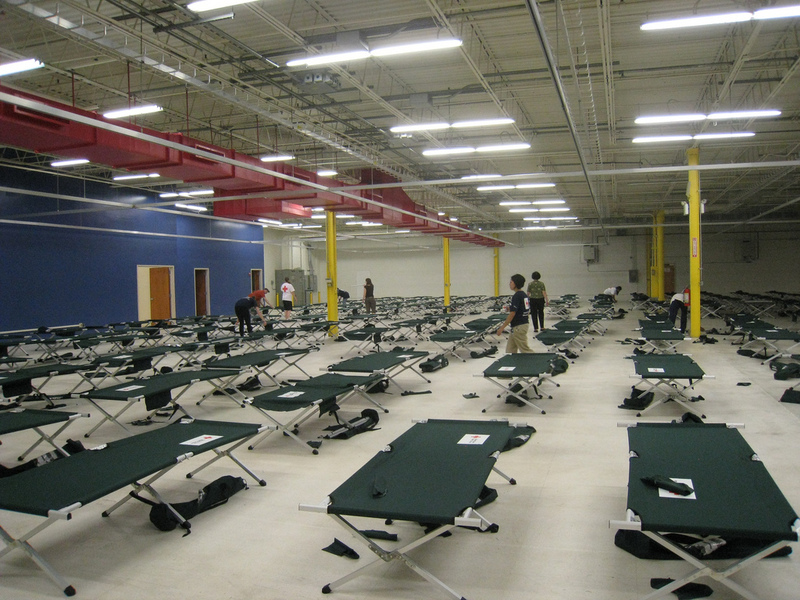 The Southeastern Pennsylvania Red Cross is holding a Tornado Readiness Drill in Chester County this weekend. Wow. . . . really?! When I was a kid growing up in the Philadelphia region we didn’t talk much about tornadoes. These strange, powerful, spiraling storms were something that happened to other people in some distant part of our land, or better yet, a magical force that dropped a house on a Wicked Witch in the Wizard of Oz. I maintained this state of blissful ignorance until 2005, when a Microburst (an extreme weather event similar to a tornado), dropped about 35 ancient trees in our town in northern New Jersey. Trees came down on several houses, on almost every main road and on power lines. It took only five minutes of extreme summer weather to make an idyllic suburban landscape treacherous for everyone and impenetrable for emergency responders. Tornadoes popped up in some unusual places in the summer of 2011. One roared down the main street of Springfield, Massachusetts in the first few days of June. You read that right, my friends – Massachusetts. It was one of 19 tornadoes in New England that day. Four people were killed in those storms. On May 19th, 2011, in Northeast Philadelphia, a tornado touched down in the mid-afternoon with 75 mile per hour winds and a 100 by 300 ft. path of destruction. 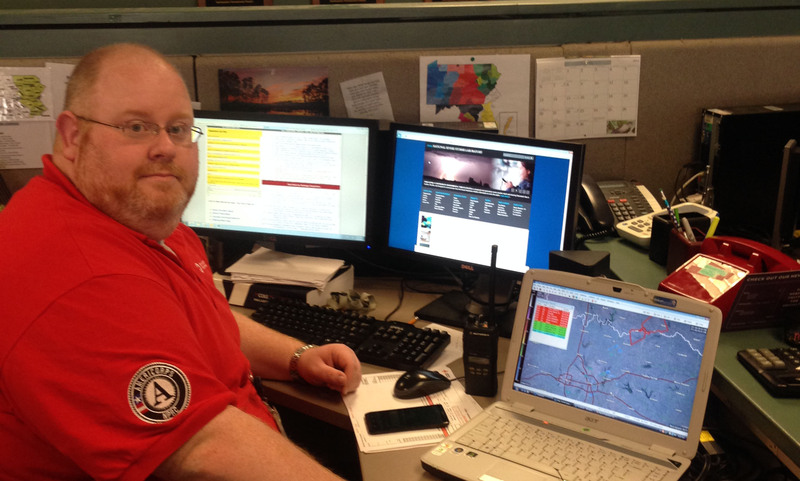 The Southeastern Pennsylvania Red Cross takes the increased threat of tornadoes in our region very seriously. 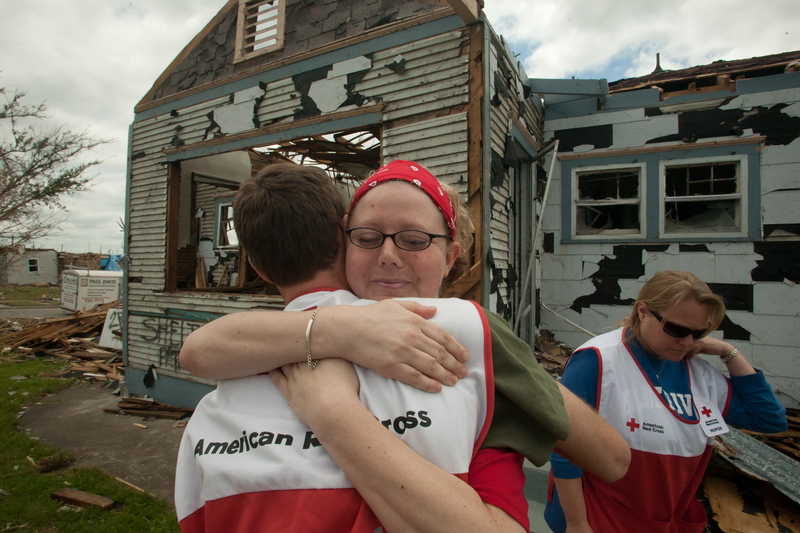 We strive to prevent disasters, prepare for their aftermath and alleviate the suffering of victims. In order to succeed, we must practice. We do so by conducting Readiness Drills at locations in our vicinity that may need assistance in the event of a weather related emergency. 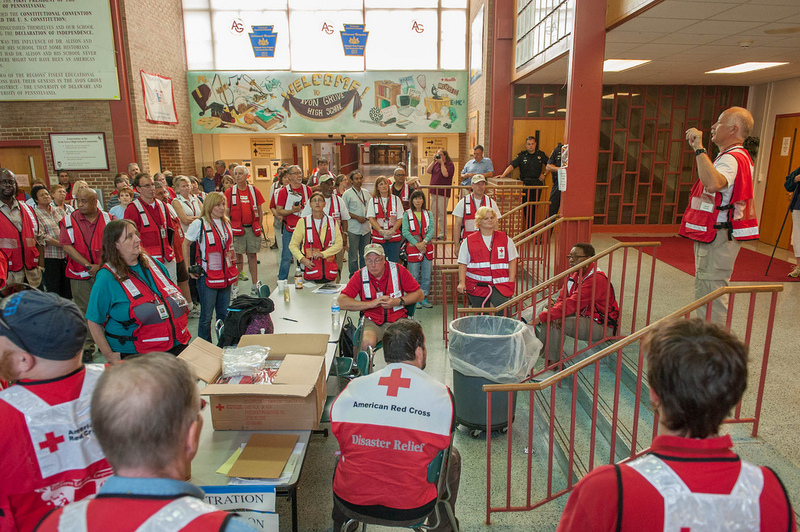 To this end, we will conduct a Tornado Readiness Drill on Saturday, June 2 at Avon Grove High School in West Grove, Pa. between 8 a.m. and 3 p.m. The Chester County Department of Emergency Services, Chester County Animal Response Team, Medical Reserve Corps, and Chester County Food Bank, will take part in training volunteers to respond to a hypothetical severe tornado where homes and businesses are destroyed and hundreds of people need a safe place to go. 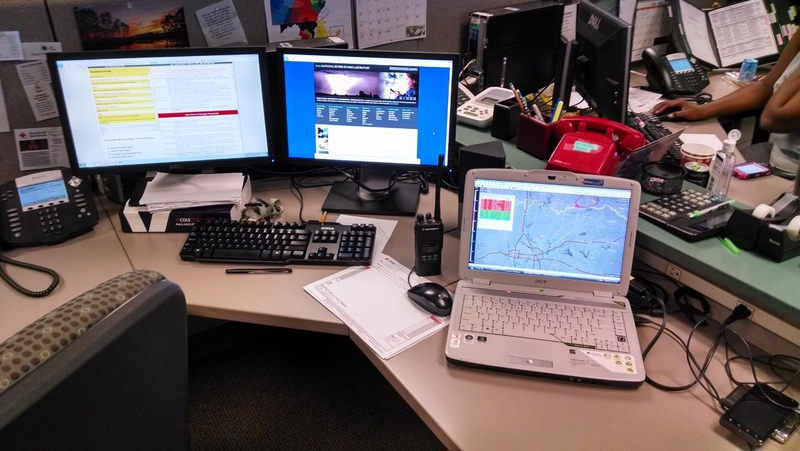 Last year, a hurricane readiness drill (pictures above) proved invaluable when Hurricane Irene hit our region in August. Participants who practiced critical disaster relief skills like sheltering, food distribution, providing basic medical and childcare needs, caring for pets, and overall disaster response decision making were better able to anticipate problems and meet the needs of those affected. Although these are weather based drills, they help us practice our response to any large scale disaster. If you are one of our generous donors, you not only support our response to disasters, your donation also helps us prepare for events we don’t know about yet. We could not hold these practice drills without your contributions and we are so grateful for your support of our efforts to be better prepared in the event of an emergency. If last year, and indeed the last 10 years are any indication, tornadoes are no longer something that Philadelphia area children wonder about in ignorance. They are now part of our world. The Southeastern Pennsylvania Red Cross will be there, and with the knowledge we gain from preparedness drills like the one in Chester County this weekend, we will be ready. That’s how I often characterized to Philadelphians what Joplin was like a day after an EF 5 tornado tore through the town. Even that though doesn’t truly do the destruction justice. If your home or business was in the path of the tornado, it got destroyed. Not just damaged, but destroyed. The tornado spared nothing. I wrote about my experience one year ago in a series of blog posts. So today being the one year anniversary of that tornado, I wanted to share a few thoughts. Of course the physical wounds are sometimes much easier to fix than the emotional ones. No doubt, Joplin residents are still scarred by what happened and won’t ever forget it. But they aren’t dwelling on it. 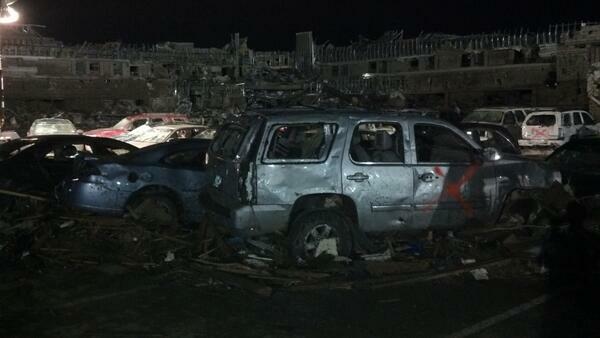 Even within hours after the tornado hit, people who lost homes, businesses, even loved ones, were helping others. Spending most of my life on the East Coast, the worst I’ve ever endured was a blizzard or mild hurricane. In general, we don’t live in fear of our entire city being blown off the map. Unfortunately I haven’t had the opportunity yet to return to Joplin, but based on what I’ve read and what I’ve heard from the many people I’ve spoken to there, the people of Joplin are determined to rebuild a better city than the one nature destroyed. There is no manual on what to do. They have to figure it out as they go. But, they know it can’t be done alone. Joplin’s victims have to rely on family, friends, and total strangers. (CBS News story about anniversary in Joplin) For my own part, I will forever be changed by witnessing the human spirit’s ability to endure. I met some amazing people. I met a woman in her 90s who narrowly escaped being swept up by the tornado as she made it to a basement just in time. I met a Red Cross volunteer who lost two loved ones in the tornado, but was still at the shelter every day to help others. I met countless of people who were lucky to be alive, but fearful of the future. I got to witness several families, separated by the tornado and fearing the worst, get reunited at the Red Cross shelter. So as I look back at Joplin one year later, I am still heartbroken by what happened there. But I am also heartened by how a city and a country came together under horrific circumstances. 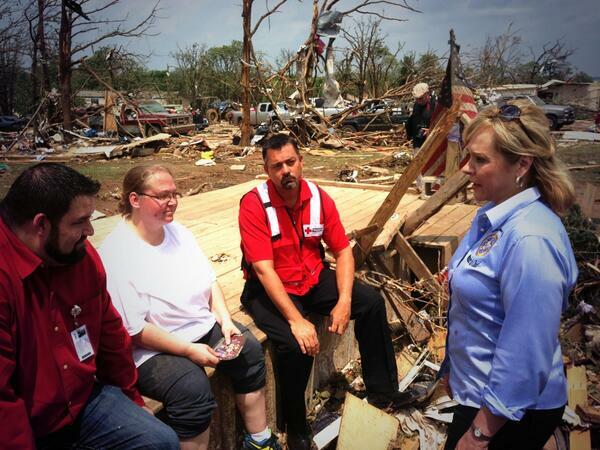 I am especially proud of the Red Cross, the only agency able to care for so many people for so long. I will continue to keep the people of Joplin in my thoughts and prayers. I ask that you do too.